Haircutting shears, also called haircutting scissors are the lifeblood of any cosmetologist. Without shears, a haircutting professional would not be able to do his or her job. To those who aren’t in the haircutting or barbering professions, shears may appear to only be a pair of odd looking scissors. Shears, however, are big investments as they are designed specifically for hair cutting purposes. Taking proper care of your shears is essential to achieving the perfect haircut and ensuring you get the most out of your investment. It is professional best practice to regularly clean and sanitize your haircutting shears. Not only will this help keep the shears in great working condition and help them last longer, but it is required by many states for hygienic reasons. Besides cleaning, proper use and storage are necessary in maintaining your haircutting scissors. Haircutting shears are to be handled gently and carefully while being used throughout the day. Throwing the shears down hard on the counter or accidently dropping them on the floor can cause damage to the alignment of the blades as well as dull the cutting edge of the blades. If the scissors get damaged or nicked when dropped, they will need to be serviced and repaired. It's also important that you don’t let others use your shears. Haircutting shears are very expensive and designed with a very specific purpose. They shouldn’t be used for everyday applications. Never use your shears to cut wrapping paper, open a bag of chips, etc. Haircutting shear maintenance begins with daily cleaning and sanitizing. Every salon and barbershop has its own shear cleaning requirements. Most of these procedures require one to clean and sanitize the scissors between clients. In addition, it is a good idea to regularly wipe the shears off during the same haircut to keep hair fragments and perspiration from the hair stylist’s or barber’s hands from interfering with the scissor’s cutting performance. Water, cleaning solution and sweat should never be allowed to dry on the shears. Not only does it make the shears look dirty, but the residue build-up can dull the scissors, deteriorate the surface of the shears and cause possible spreading of infections through cross contamination. The proper cleaning of haircutting shears involves rinsing the shears with soap and water, careful and thorough drying and the use of rubbing alcohol or quaternium haircutting shear sanitizer solution. Sometimes the use of an autoclave after washing and drying is used. In addition to the regular cleaning and sanitizing throughout the day, daily oiling of shears will also keep them in tip-top shape which will extend their useful life and keep them in great operational order. Many hairstylists and barbers oil their shears at the end of the day when their scissors won’t be used for many hours. The haircutting shear oil keeps them from rusting and getting stiff, allowing for easy, smooth, efficient and controlled haircutting. Rusty or stiff shears will be difficult to use, causing hand discomfort for the haircutting professional and an unsatisfactory cut for the client. Hair shear oil also helps flush out lodged or stuck hair fragments from the inside of the scissors that the regular washing and sanitizing may have missed. When using shear oil, it is best to have the scissors open to 45 degrees and place a small drop on the center joint holing the two blades together. Gently rub the oil into the scissors using a soft cloth. Too much oil can cause the shears to become slippery which will increase the risk of them being accidently dropped. After cleaning, drying, sanitizing and oiling, keeping haircutting shears stored in a way that keeps them protected and dry will also extend their useful life and maintain their performance and handling. After they’ve been cleaned, sanitized and protected, store your shears in a protective case, with a soft, absorbent lining that will help keep the shears from moisture and environmental factors. The shears should have their own compartment in the storage case, and you should never store your shears loosely with other tools. If the shears and other tools can knock against each other, you run the risk of damaging the blades. Store the case in a location that will remain dry. Not only do the blades need to be sharp, but they should be easy and comfortable to handle. A pair of haircutting shears that either have a tension that is too loose or too tight can negatively affect the scissors proper handling and cutting ability. Too little tension in the scissors can lead to damaged blades and additional stress on the hands. Loose tension scissors will yield a poor haircut as it will bend, not cut, strands of hair. When haircutting shears become dull, it is important to have them sharpened and serviced by a professional shear sharpener or sharpening company. Professional sharpening will mean the haircutting shears will be sharpened properly, using tools and techniques that won’t damage the scissors. Hairstyling professionals and barbers know that their haircutting scissors are for only cutting hair. Family members, friends and clients, however, may see them differently. 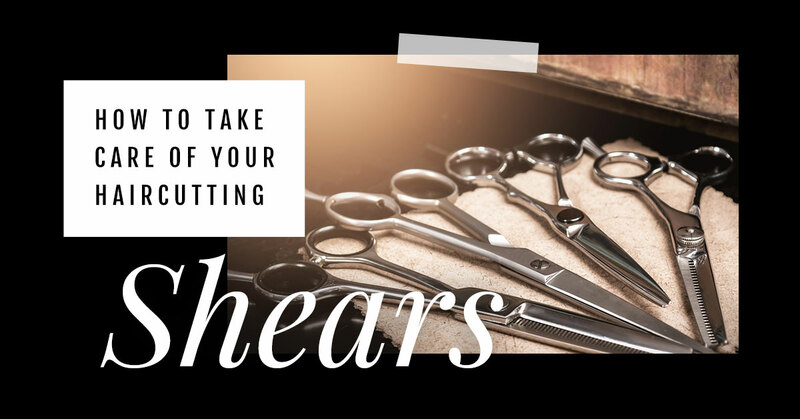 A client may want to borrow your shears to cut open an envelope or cut a loose thread from their sweater, but this can cause damage to the scissors. While to the untrained eye, there isn’t much of a difference between a strand of hair, a piece of paper and a strand of polyester. Cosmetologists, however, know there are noticeable differences. Hair has a different thickness and texture than cloth and paper. Hair is made of microscopic strands of connected proteins. Paper is made of compressed wood pulp and fiber. Fabric entails twisted threads of woven cloth. When haircutting shears are used to cut anything other than hair, the blades become dull quickly and the blades can be thrown out of proper alignment. Following these tips for how to take care of your shears will help make your shears last longer and deliver easy, comfortable, accurate and great-looking haircuts. The hairstyling and barbering profession is a fulfilling, meaningful career with many professional career paths. Those looking to connect their passion for hairstyling and making people look and feel their best, contact us at Taylor Andrews to enroll in our hair stylist courses or to learn more about our other cosmetology programs. We are a highly recognized beauty school with a variety of course schedules allow students to get the education and experience they need for their cosmetology career at their convenience. Contact us today to learn how we can help you achieve your dream of becoming a hair stylist or barber.